Any book that sets itself the task of addressing American culture has, it seems, a built-in obsolescence. Culture shifts are radical and swift, and it would seem that distance is necessary for any serious analysis. I am reminded of historian Barbara Tuchman’s opinion that history cannot be written without the passage of at least a half-century. We’re simply too close to the subject matter otherwise. 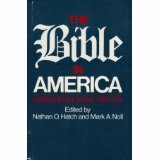 The Bible in America, edited by Nathan G. Hatch and Mark A. Noll, does not claim to be an analysis of the current situation, but it stands as a representative of how much has changed since the 1980’s. The era in which the book was written is stamped all over it like the Preppy look or Doc Martens. American culture was very different then. Some of the contributors noted that the Bible, as we’ve often been told, is on its way out. Elections of the new millennium would give the lie to that observation, and we might now argue the same, but I wonder if our view is long enough. The source of my wonder is a basic observation. The Bible was foundational for the idea of the United States. Those who have joined the “melting pot” (willingly or unwillingly) have been brought into a soup whose stock is Bible flavored. I’m not naive enough to think that it is undiluted or even anywhere near its original form, but as a former biblical scholar I’m sensitive to the motifs and themes of the Bible and I see them daily in undiminished numbers. Transmutation is not the same as exodus. I make no judgment whether this is a good or bad thing. It simply is. Those who think it is an exaggeration to put such prominence on the Bible in American culture should read the first couple of essays in this book. It may have been that without the Bible the will to cross the dangerous water to an uncertain (and to many, catastrophic) future would not have been so pressing. Like most collections of essays, this little volume has a grab bag of wisdom. Reading it is like taking a stroll through the ’80’s again. We seemed to know things with a certainty then that has all but vanished these three decades hence. The Fundamentalist movement provided a Tea Party appropriate to Mad Hatters and White Rabbits alike. Presidents declared that we were on Crusades again. Megachurches have the budgets of small developing nations. I’m not about to make any predictions for the future of the Bible here. An observation, simple, but fairly obvious, will have to suffice. Since colonial times, Americans have always had their Bible. It hasn’t always been the same book, and it hasn’t always been interpreted in the same way, but it hasn’t ever gone away. I can’t say about the future, but right now I’m about ready to put on my Ray-Bans listen to some Madonna.